Claire’s birthday! – My Outlander Blog! It’s Claire’ s birthday….huh…. 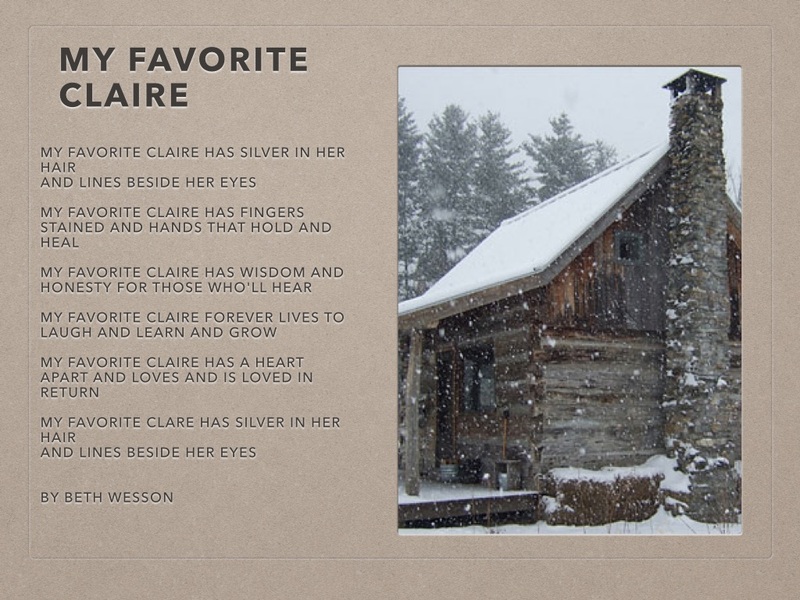 What would a birthday celebration for Claire be like? Hmmmm…giving this some thought. Let me set the scene. The setting: Gotta be Frasers Ridge in the big house. I’d have them celebrate there because I think that’s where she was happiest. This is where she built a life and home with her love. The decorations: I picture the table set with a homespun cloth, candles and a crock full of the posey Jamie has picked from the fall colors found in their woods. No poison ivy this time <g>. The food: I see the birthday cake is walnut layer with blackberry jam filling. Dinner is a beautiful roast turkey that Brianna shot and samples of the plenty Claire has stored in the pantry. The room is full of the delicious aroma of brewing coffee and the firelight makes the glass whiskey decanter glow. The guests: They are all there, those Claire loves; Jamie, Brianna, Roger, Jem and Mandy, Ian and Rollo, Fergus, Marsali and their brood, Lizzy and the twins and the Buggs. Rollo is lying before the hearth and Adso is winding his way through legs and chairs. I see Jamie, wearing his good shirt, has plaited his hair and Ian’s shock of brown hair looks mysteriously slicked down. The children’s faces have the rosy gleam of freshly washed cheeks and are ringed with smiles. The gifts: The ever practical Claire is thrilled with some new equipment for the surgery that Jamie asked Lord John to procure. She gets emotional over a sketch Bree did of her healing hands. Jamie wraps his arms around her waist and kisses her neck while she fusses over the pretty rocks the children have given her. Roger leads them all in a round of the birthday song. They talk and laugh and play and celebrate the day. 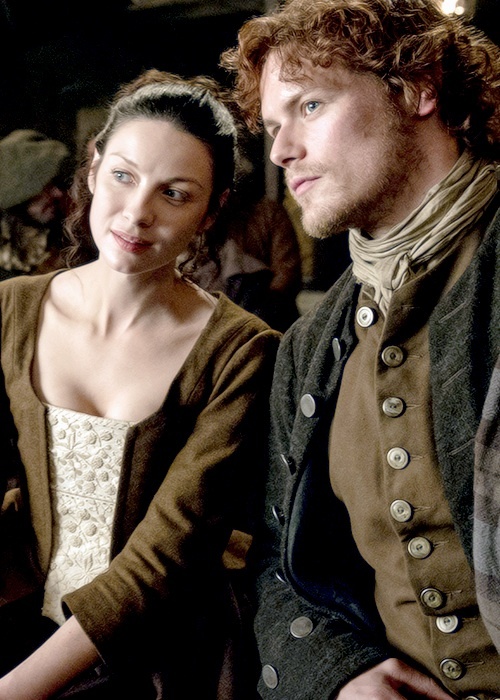 And…at the end when everyone has gone to their own homes, Jamie takes Claire to their bed where they talk of all the bountiful blessings God has seen fit to give them, especially the gift of each other. Outlander: Even the animals are well written! …how does she do that!? Perfectly “pictured”. I wanted to be there! Nicely done! That would be a lovely and lively birthday for Claire. Beautifully described. And yes…I want to be there too!! I really can picture it! Oh dear God someone pass the tissues!! That was beautiful. What a beautiful scene you set! Happy Birthday, Claire. What a lovely scene you have painted for us of a happy day for Claire and her family! I loved the presents and the dinner… Especially the cake! Thank you for another great post and a touching moment of their family gathered round. Thank you! And I don’t think I could stop! Wow that was beautiful! The perfect birthday celebration for Claire! the sketch of her hands–perfect! Diana G, Sam, Cait, and all the rest of us are there too! Thank you Beth for taking us to the Ridge with your beautiful words on this very special day. It’s so nice to see them all together and happy after all their trials and tribulations. Do you think perhaps William and Lord John Grey may have dropped in to extend their good wishes…as a big surprise? Oh wait…maybe Diana will cover all that in a future. Thank you, Beth, for inviting us to the party. I felt myself being there. Beautiful! Just reading The Fiery Cross for the first time and, if we can’t be in Scotland, this is the next perfect setting. Thank you for your lovely blog. It touches me so often. I was surprised to find myself with tears in my eyes reading this. As I pictured this scene, I was surprised to feel tears in my eyes. Thank you.